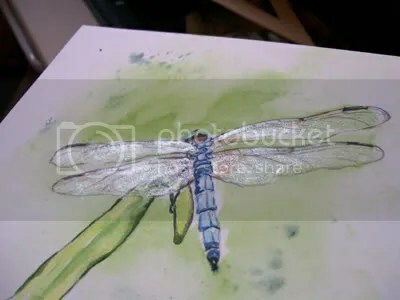 Let’s Paint the Blue Dasher Dragonfly! – Let's Paint Nature! 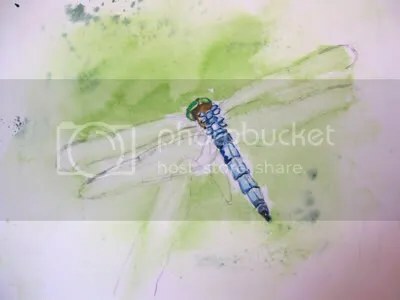 Let’s Paint the Blue Dasher Dragonfly! Here is our reference photo. Isn’t he handsome? Step 1: Make a rough sketch on 140lb. hot press watercolor paper using graphite pencil. Step 2a: Wet your background. 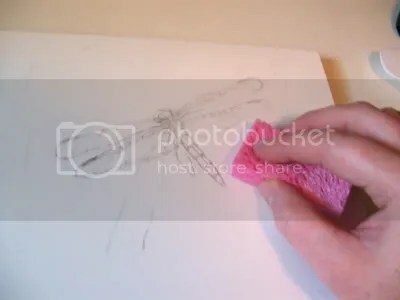 Here is an easy and efficient way to wet your background: take a wet sponge, wring it out, and evenly go over the background INCLUDING the wings. The sponge is fast, it doesn’t soak your paper, and you get even coverage. Why did we wet the wings too? 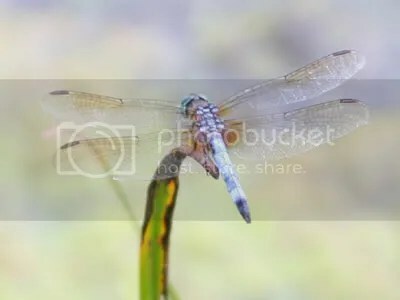 The blue dasher’s wings are transparent, so we need to show the background behind the wings as well. Step 2b: This is going to be a vignette. A vignette is when the painting has no definitive edges. The background color seems to fade out on all sides…I like that a lot. After I sponged my background I waited until the paper was no longer shiny. I made a wash mixture of yellow and sap green (more on the yellow side) and painted the background. To soften the edges I took a little spray bottle and sprayed the edges. While wet, I took some indigo blue and flicked a few spots to speckle the back and give it interest and texture. 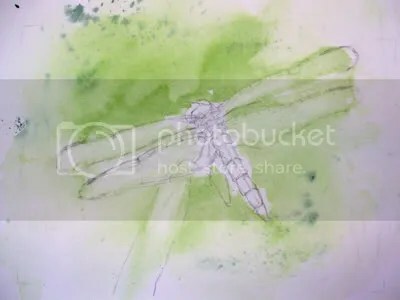 Important: wet the wings with a clean brush and clean water and scrub the color out, then blot with a paper towel. 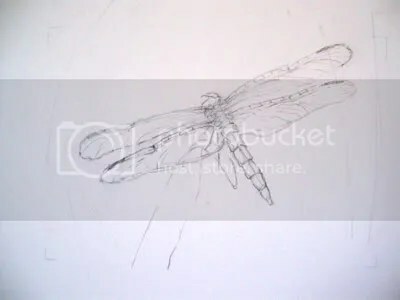 Even though the wings are transparent, we have to show the surface of the wings. Don’t worry even though it sounds hard, I’ll make it easy! Step 3: Let’s start with his eyes. The male blue dasher has turquoise eyes. I didn’t have turquoise watercolor paint, so I made my own. Half the time when something like this happens, I make my own mixture without even knowing what I’m doing really. I guess a lot. If it doesn’t work I don’t’ use it and no harm done. If it does work I use it and I’m happy because I just learned something new. I will lock that information somewhere in my brain and when I need it next, I will know what to do. I will never get to that point however, if I don’t PRACTICE ALL THE TIME! Getting better is so much fun. For his “neck” I used burnt umber. Step 4: For the body I used cerulean blue. Wait until it dries and then make another layer of cerulean blue on the outside edges only. Let dry. Step 5: Defining the body. Using cobalt blue, I painted the edges of the segments of his body. I needed a small rigger brush to do this delicate work. I also made a shadow behind his eyes on his “neck” using a darker brown. Don’t panic! Believe it or not, there are not too many steps here. First, we have to paint his little legs under his body because you can see them through the wings. 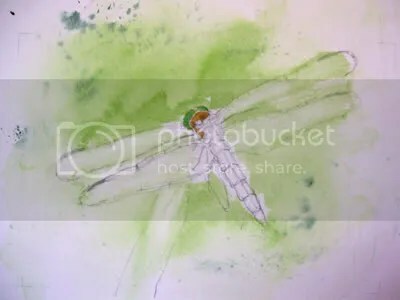 With gray paint (every color left on your pallet mixed together) and a small rigger brush, outline the outside of the wings and a few important lines inside the wings. Don’t worry about every single line and “cell”. 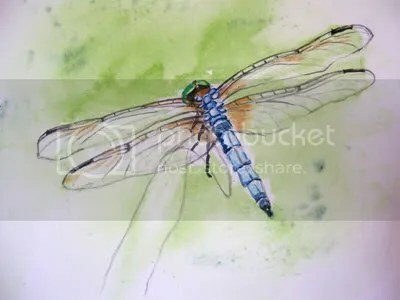 It’s not that I can’t paint the wings in great detail, but that I wont. I refuse to spend 19 hours getting the details exact. I took a picture for exact-ness. This is a painting with feeling. Next, the blue dasher has the most beautiful amber spots on his wings in only a few spots. I used yellow ocher and a little country brick to make a great amber color. Paint in the spots closest to his body and near the upper and outer parts of the wings. 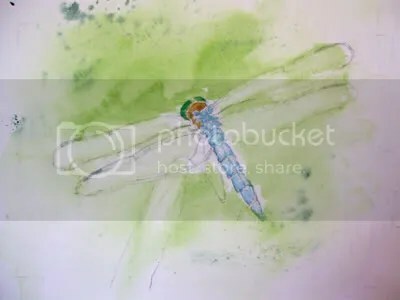 Remember, you are going to paint right over the legs because the legs are under the wings. Step 7: Here comes the fun part! I used iridescent medium made by Winsor & Newton. It is a watercolor medium that you can mix with your watercolor paints or paint on top of your dried watercolor painting. Here is a tip: If your bottle has been sitting for a long time, like mine has, you will need to take the end of your paint brush stick and mix it up on the bottom of the bottle and then tightly close the bottle up and let it sit upside down for a while. It does separate if left for a long time. Iridescent medium is wonderful because it is not gaudy and overly glittery. It is very, very subtle…we like that. I painted the medium over my dried painting on the wings only. I took this picture (while it was still wet) on an angle so you can see where I covered the wings. When looking at the painting head on, you cannot tell there is iridescent medium applied. I finished the leaf by painting the whole thing yellow and while wet, dropping sap green down the middle. When dry I mixed sap green and indigo blue and painted the edges of the leaf. Step 8 Final: Here is the final product. You cannot even tell we have iridescent on the wings…but it’s there! I darkened his legs that are not under the wings (part of the furthest one down and a section peaking in between the top wing and the bottom wing) by using my own black mixture; indigo blue, crimson and sap green. 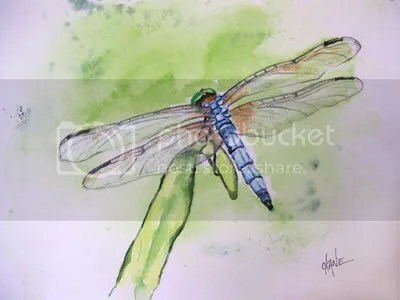 Thank you so much and I hope you enjoyed this demonstration of how to paint a blue dasher dragonfly! Alan: Don’t you love mediums??? When I spotted it at the store, I didn’t even know what I was going to use it for but I bought it anyway! I just love the little glitter in it!!! Another beautiful one. I love using irridescent & metallic paints (as well as touches of gloss varnish,) to create light effects, don’t you? Lana: Thanks so much! I love it too, a special surprise it gives.